For other Battles of Narva, see Battle of Narva. ^[a] About 12,300 men of which 1,800 were stationed in Narva with 297 artillery pieces and 10,537 (5,889 infantry, 4,314 cavalry, 37 cannons with 334 crew) assaulting the Russians. ^[b] Up to 37,000 men of which 4,000 were deployed at the siege-works with 125 artillery pieces and 33,000 (23,652 infantry, 9,000 cavalry, 70 cannons with 321 crew) facing the Swedes. ^[d] Almost the entire Russian force was either killed or captured during the battle (except for some 4,000 cavalry who managed to escape over the kamperholm bridge). 8,000 Russians were reported killed and another 1,000 drowned. Over 20,000 were captured and disarmed but later set free and allowed march to Russia (except for 700 men [134 officers] who were set prisoners). 23,000 out of initially 37,000 Russians managed to reach back to Russian land, estimating the Russian final casualties to about 14,000 either dead during the battle or the harsh march back to Russia. The Swedes also seized 171 standards and banners, 145 cannons, 28 mortars and four howitzers as well as 24,000 muskets. The Battle of Narva (Russian: Битва при Нарве; Swedish: Slaget vid Narva) on 30 November [O.S. 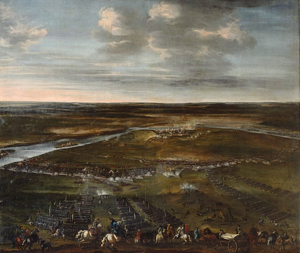 19 November] 1700 (20 November in the Swedish transitional calendar) was an early battle in the Great Northern War. A Swedish relief army under Charles XII of Sweden defeated a Russian siege force three to four times its size. Before, Charles XII had forced Denmark–Norway to sign the Treaty of Travendal. Narva was not followed by further advances of the Swedish army into Russia; instead, Charles XII turned southward to expel August the Strong from Livonia and Poland-Lithuania. Tsar Peter the Great of Russia took Narva in a second battle in 1704. During the 17th century, Russia was less advanced technologically than the rest of Europe, a condition which extended to its armed forces. Despite this shortcoming, Peter the Great of Russia was keen to get "an adequate opening to the Baltic" by conquering parts of Sweden's Baltic provinces, that were lost by Russia during the Time of Troubles. However, there was a problem: while the armies of most of the states of the time consisted of poorly trained militia and small contingents of mercenaries, Sweden had a professional army, one of the largest and most disciplined armies of northern Europe. The new Russian tsar, Peter I, would drastically modernize Russia in the coming years, but the army with which he traveled in 1700 was still poorly drilled. Preparing for war, he decided to form 31 new regiments. At the same time, in the spring of 1700, the revision of the officer Corps was made. As a result, the majority of officers were sent into retirement or to garrison units, where they were to serve without pay. A catastrophic shortage of command personnel (up to 70% at the company level) resulted. The vacancies were filled with young Moscow noblemen who had neither the experience of command, nor the experience of service in the infantry, nor regular military training — their traditional places were elite irregular cavalry or court service. Serious problems were also with non-commissioned officers - they were not veteran soldiers, but elected from new recruits. Russia made a military alliance with Frederick IV, King of Denmark–Norway; and August the Strong, King of Poland–Lithuania and elector of Saxony, to wage war against Sweden. Whereupon three countries attacked Sweden from different directions. The Danish and Saxon armies acted indecisively, bounding themselves to unsuccessful sieges of fortresses. The Commonwealth refused to support his king, and Russia waited for a peace treaty with the Ottoman Empire to transfer its struggle from south to north. Charles XII, assisted by the Royal Navy and the Dutch Navy, first landed in Humlebæk north of Copenhagen and forced Denmark-Norway to leave the alliance in August 1700 (until 1709). He then moved part of the Swedish army across the Baltic Sea to Estonia where it was joined by Estonian and Finnish regiments of the Swedish army. The Swedish army was commanded personally by Charles XII, assisted by Lieutenant-General Carl Gustav Rehnskiöld and General of the cavalry Otto Vellingk. During the Scanian War in 1675–1679 Vellingk already was a colonel and commanded a cavalry regiment, and Rehnskiöld rose from lieutenant to lieutenant-colonel. Both also had experience of service in foreign armies: Vellingk served for 10 years in France, during which he rose to the rank of colonel, and Rehnskiöld participated in the Franco-Dutch War (1688—1697). From 1698 Vellingk was a governor in Ingermanland and at the beginning of the Great Northern War commanded a small corps, sent to help besieged Riga. The Russian forces were commanded by Peter and Charles Eugène de Croy. Peter had left Narva just the day before and was therefore not present during the actual fighting. Trying to explain this act, some historians suggest that he did not expect an immediate attack on his well-fortified and numerically superior force or he was sure that such an attack would be easily repulsed. It is suggested that Peter wanted to speed up the arrival of reinforcements, address supply issues, and negotiate with Augustus. Some interpretations consider his departure from Narva the night before the battle as a cowardly act; most of Europe mocked the Tsar for his departure. However, some scholars believe this accusation has little merit, as reportedly the Tsar had placed himself in physical danger too many times for this departure to be an act of cowardice. Peter not only left the army on the eve of the battle, but also took with him the formal commander-in-chief — Field Marshal Fyodor Golovin. The new commander-in-chief, de Croy, in fact was not at all a Russian general — he was sent by August II with a diplomatic mission (he asked for an auxiliary Russian corps) and met with Peter in Novgorod only on 10 September [O.S. 30 August] 1700. Due to a lack of experienced commanders Peter retained de Croy with him; they reconnoitered the fortifications of Narva together, but de Croy did not hold any official post and never before commanded any unit of the Russian army. De Croy refused to accept the command several times and relented only after Peter personally "strengthened his resolve with a glass of wine". This happened only the day before the battle, and the official instruction for the transfer of command was dated 30 November [O.S. 19 November] 1700, i.e. when the Swedish relief force arrived at Narva. The Russian army near Narva was divided into three main parts (general'stvo), commanded by Avtonom Golovin, Trubetskoy and Weide. All of them were young men (born in 1667) and their combat experience was limited to the two sieges of the Turkish fortress of Azov, but they had served in Peter's favorite poteshnye voiska. More experienced generals were sent to command remote garrisons. A popular commander, Sheremetev, known for his successful actions against Turks, had no rank in the hierarchy of the regular army and was ordered to command the feudal levy cavalry. The Swedish artillery was commanded by experienced Master-General of the Ordnance Johan Siöblad [sv]. He had almost forty years of service in artillery and was an author of the first Swedish Artillery Regulation of 1690. Massie notes the excellent actions of the Swedish artillery in the skirmish at Pyhajoggi Pass, eighteen miles west of Narva. Under the screen of their dragoons the cannons were quickly deployed and suddenly opened fire on the clusters of Russian cavalry from a close distance. Since the Russians no artillery at all at Pyhajoggi, they could not hold this advantageous position and had to retreat. The formal commander of Russian artillery was Prince Alexander of Imereti, a young man of 26, a close companion of Peter in his entourage. His experience was limited to several months studying the theoretical foundations of gunnery in The Hague in 1697. After his return to Moscow he soon received the highest artillery rank of General Feldzeugmeister (May 1700). There is much evidence of the extremely unsuccessful actions of Russian siege artillery against Narva. At the afternoon of 29 November [O.S. 18 November] 1700 Charles XII approached the village of Lagena, 7 miles from Narva, and made a final inspection of his army. Charles was not sure if Narva was still holding, so he ordered to give a prearranged signal by cannon shots and then got a response from a fortress. Earlier, the Sheremetev's cavalry joined the main forces. Thus, the Russian siege camp was warned about the approach of the enemy. De Croy carried out an inspection of the army and ordered to increase vigilance and prepare firearms, and to keep half of the army on alert throughout the night. On the morning of the next day, "before sunrise," it was ordered to give soldiers the charges and build the entire army. Among other instructions was the prohibition to open fire earlier than 20–30 steps to the enemy. On 19 (OS) or 30 (NS) November 1700 (20 November in the Swedish transitional calendar), Charles XII positioned his 10,500 men (another 2,000 men were garrisoned in the city and would take part in the battle at a later stage) opposite the besieging Russian army of about 34,000 to 40,000 troops. The Swedes approached the Russian army at 10 a.m. and began to prepare for an attack. Charles and his generals examined the Russian position, the soldiers stored the fascines to overcome the ditches, surrounding it. De Croy was concerned about the small size of the Swedish army and suspected that this was only the vanguard of the main forces. Sheremetev proposed to lead the army out of the entrenchment in the field and attack the Swedes, but was not supported by other generals. De Croy decided to leave the army stretched for 4 miles (6.4 km) and sandwiched between two rows of ramparts. The space between the ramparts was uneven: about 1,200 metres (3,900 ft) on the right Russian flank, about 250 metres (820 ft) in the center, and on the left flank – only 60–100 metres (200–330 ft). There were many barracks for soldiers between the ramparts, which made it difficult to maneuver. In the center of the Russian position was the Goldenhof Hill, fenced on all sides by barracks and sharpened stakes (the chevaux de frise) and adapted to all-around defence. Charles divided his infantry into two parts and directed them to the north and south of the Goldenhof Hill. On the right (southern) flank were 11 "field" battalions under the command of Vellingk. On the left (northern) flank were 10 "field" battalions under the command of Rehnskiöld, including small column of two battalions under the command of Magnus Stenbock, were was Charles himself. Grenadiers with fascines marched in the vanguard of the infantry columns. The Swedish cavalry (≈4,300 men) covered the flanks of the infantry and had to prevent Russian attempts to exit the fortifications. The Swedish artillery (37 guns at all), located on a small rise, bombarded the places planned for the attack. The exact battle order of the Russian army is unknown – Russian documents are not preserved, and the Swedish data are contradictory. It is known that the "division" (general'stvo) of Trubetskoy was located in the center. It was the weakest part of the three main divisions: there was only two "regular" infantry regiments, and they were even worse drilled than the rest – they were formed as late as August 1700, and in September Trubetskoy already marched to Narva. Trubetskoy also had four weak regiments of local streltsy from Novgorod and Pskov garrisons and, may be, there was two regular infantry regiments temporarily separated from other divisions. Russian colour taken at the battle of Narva 1700. By afternoon the Swedes had finished their preparations and moved forward at 2 p.m. At that moment it got colder, the wind changed, and the snowstorm blew directly into the eyes of the Russians. :686 Some Swedish officers asked to postpone the attack until the end of the storm, but Charles saw his opportunity and advanced on the Russian army under cover of the weather. The Swedes attacked with two highly dense shock groups, quickly approached the Russian positions and gave a volley, after which the Russians "fell like grass". At first, the Russians vigorously resisted: "They returned a heavy fire and killed many fine fellows", but within 15 minutes the Swedes filled the ditches with fascines, broke into the fortifications with cold steel arms, and "a terrible massacre" began. Acting according to the plan, the Swedes moved to the south and north along the fortification line, rolling up the Russian defense. They attacked inexperienced Russian regiments and crumbled them one by one. There was panic and chaos, Russian soldiers began killing foreign officers and de Croy with his staff hurried to surrender. Masses of panicking Russians troops rushed to the only Kamperholm Bridge over the Narova River, located at the northern edge of the defensive line. At one crucial point, the bridge collapsed under retreating Russian troops. On the right (northern) flank of the Russians, only two regiments of the future Guards (Preobrazhensky and Semyonovsky) retained the battle order. They rebuilt in a square, arranged improvised barricades of wagons and stubbornly held on; part of the running soldiers joined them. Encouraging his troops, Karl personally led the attacks against this center of resistance, but they were repulsed, and a horse under Karl was killed. Most of the Russian commanders, including generals Golovin and Trubetskoy, managed to join this group despite the surrender of de Croy. On the left flank, General Weide was seriously wounded at the very beginning of the battle, but his "division" for the most part did not succumb to panic and even made a successful counterattack, but could not reconnect with the rest of the army. After the first clash the high command of the Russian army lost its morale and decided to capitulate. The Swedes, in turn, were exhausted and could not finish off those parts of the Russians who did not succumb to panic and kept their ground. The right flank of the Russian army capitulated faster on a free exit with weapons and colours, but general Weide on the left flank capitulated later and was already forced to hand over weapons and banners. All the artillery and waggon-trains also fell into the hands of the Swedes. The Swedes and the Russians together repaired the Kamperholm Bridge through which capitulated troops crossed to the right bank of the Narva River. The highest Russian commanders remained with the Swedes, initially as hostages, in order to ensure the fulfillment of the terms of surrender. But later, Charles violated the treaty and kept them as prisoners. The Swedes explained this act by not receiving the treasury of the army. Sheremetev with his cavalry marched to the south along the left bank of Narva river to Syrensk, crossed the river on the bridge there and thus escaped captivity. The Battle of Narva was a terrible defeat for the Russian army. In total, the Swedes captured 10 generals and 10 colonels, many officers of the regimental level were killed in battle. The regimental rolls, made in January 1701, show that the total loss of personnel was about 25% (and 57–68% in two infantry regiments of Trubetskoy's "division"). In the Golovin's "division" (without taking into account the two regiments of the Guards) there left only 250 officers out of 356, the state of the Weide's "division" was somewhat better. Heavy losses were also in armaments, especially in artillery. Swedes captured near Narva 173 pieces, including 64 siege cannons (and a bit later additional 22 mortars in a baggage train near Yam) and 4050 muskets. By the spring of 1701, the shortage of personal weapons was mostly replenished, but the former "divisions" of Golovin and Weide did not have regimental artillery at all. If Charles had continued the campaign against Russia (General Vellingk suggested to attack Novgorod and Pskov), the Russian army very likely would have suffered another defeat. In 1900, 200 years after the battle of Narva, the Preobrazhensky and Semyonovsky regiments initiated the construction of a memorial to the Russian soldiers who had fallen in the Battle of Narva. The memorial consists of a granite pedestal with a cross on top, placed on a mound of earth. The inscription says: "Our heroic ancestors who fell in November 1700." On 20 November 2000 the Swedish Minister for Foreign Affairs, Lena Hjelm Wallén inaugurated a new memorial monument to celebrate the victory. Erected with an economic contribution from the Swedish Institute, it replaced an older memorial, erected in 1936, which disappeared during the Second World War. The monument is surmounted by a "Swedish lion", his left paw resting on a ball engraved with the Three Crowns of Sweden. It stands on a pedestal of granite. The Latin inscription on the pedestal reads "MDCC" (1700) and "Svecia memor" ("Sweden remembers"). Four years after the first battle of Narva, Peter I marched again in an attempt to capture Narva. Marshal Boris Sheremetev's force of 20,000 captured Tartu on 24 June. :697 Sheremetev then besieged Narva, where the garrison was under Commandant Major-General Henning Rudolf Horn af Ranzien:697 and consisted of 3,800 infantry and 1,300 cavalry. The Russians captured Narva on 20 August 1704 and massacred some of its Swedish inhabitants before Peter I stopped them. :697 Horn, several officers and a large number of Swedish soldiers were captured, with about 3,200 casualties while the Russians lost up to 3,000 men during the siege and the battle. ^ a b c d Беспалов 1998. ^ Massie 1980, p. 336. ^ Петров 1901, pp. 236–238. ^ Grey, Ian (2015). Peter the Great. New Word City. ISBN 978-1-61230-922-4. ^ Lars-Eric Höglund, Åke Sallnäs, Alexander Vespalov (2011). Great Northern War 1700–1721, II. ^ Generalstaben (1918–1919). Karl XII på slagfältet. ^ Tacitus.nu, Örjan Martinsson. Russian force. ^ Hughes, Lindsey. Russia in the Age of Peter the Great. — New Haven: Yale University Press, 1998. pp. 30. ^ Massie 1980, p. 323. ^ a b Frost 2000, p. 228. ^ Frost 2000, p. 263. ^ a b Massie 1980, p. 329. ^ Дмитрий Николаевич Бантыш-Каменский (1840). Биографии российских генералиссимусов и генерал-фельдмаршалов: Часть первая. p. 30. ^ Петров 1901, pp. 218–220. ^ Massie 1980, pp. 688–689. ^ Massie 1980, pp. 682–683. ^ Massie 1980, p. 328. ^ Петров 1901, pp. 223–224. ^ Massie 1980, p. 330. ^ a b Петров 1901, p. 199. ^ a b Massie 1980, p. 332. ^ Brian Davies (2011). Empire and Military Revolution in Eastern Europe: Russia's Turkish Wars in the Eighteenth Century. A&C Black. p. 65. ISBN 978-1-4411-6238-0. ^ Russian BO at Narva on 19/30 Nov, 1700 by Fer & Wolff. ^ Massie 1980, p. 332–333. ^ Massie 1980, pp. 333–334. ^ Петров 1901, p. 234. ^ Петров 1901, p. 234–238. ^ a b Великанов В.С. К вопросу о состоянии русской армии после нарвского поражения, зима 1700–1701 гг. // Война и оружие: Новые исследования и материалы. Труды Седьмой Международной научно-практической конференции, 18–20 мая 2016 года. СПб. : ВИМАИВиВС, 2016. Ч. 2. С. 26–42. Snyder, Kerala (2002). The Organ As a Mirror of Its Time: North European Reflections, 1610–2000. ISBN 978-0195144154. Black, Jeremy (1996). Warfare. Renaissance to revolution, 1492–1792. Cambridge Illustrated Atlases. 2. Cambridge University Press. ISBN 0-521-47033-1. Frost, Robert I (2000). The Northern Wars. War, State and Society in Northeastern Europe 1558–1721. Longman. ISBN 978-0-582-06429-4. Massie, Robert (1980). Peter the Great, His Life and World. Ballantine Books, 928 pages. ISBN 9780307817235. Ullgren, Peter (2008). Det stora nordiska kriget 1700–1721 [The Great Nordic War] (in Swedish). Stockholm: Prisma. ISBN 978-91-518-5107-5. Kuvaja, Christer (2008). Karolinska krigare 1660–1721 [Karolinska Warrior 1660–1721] (in Swedish). Schildts Förlags AB, 139 pages. ISBN 978-951-50-1823-6. Беспалов, Александр (1998). Северная война. Карл XII и шведская армия. Путь от Копенгагена до Переволочной. 1700–1709 [North War. Charles XII and the Swedish army. The path from Copenhagen to Perevolochna] (in Russian). Moscow: Рейтар. ISBN 5-8067-0002-X. Петров, А. В. (1901). Город Нарва. Его прошлое и достопримечательности в связи с историей упрочения русского господства на Балтийском побережье. 1223–1900 (in Russian). St. Petersburg. ISBN 9785446084876. Wikimedia Commons has media related to Battle of Narva (1700). This page was last edited on 12 March 2019, at 18:54 (UTC).